On its face Warrior sounds like an artifact, a big studio melodrama from the 1930s. Two men face off in a title bout – and they’re BROTHERS! But when so many films are paralyzed by ironic distance and insist on flattering audiences instead of engaging them, it takes genuine daring to embrace a big archetypal story and infuse it with reality, soul and passion. And that’s what director/co-writer Gavin O’Connor does. It’s not the end of O’Connor’s ambition, either. In spinning the sprawling saga of the battling Conlon clan he touches on hot-button issues Hollywood movies typically avoid (the traumas visited on servicemen in Iraq and Afghanistan, the economic collapse and its impact on working class Americans) as well as the long-term consequences of alcoholism on families. All this and a “big fight” finish that’s not a classic boxing match but a showdown set in the hardscrabble world of mixed martial arts. Warrior wins before it steps into the ring thanks to a top-flight cast. Tom Hardy, who brought lightness and panache to Christopher Nolan’s Inception, plays returning Marine Tommy Conlon. Joel Edgerton, of the recent Australian noirs The Square and Animal Kingdom, is his brother Brendan, a one-time hooligan who has found stability as a husband and father but can’t support his family on his teacher’s salary. Both Conlons see a way out in Sparta, a winner-take-all elimination tournament bankrolled by a hedge fund millionaire to determine who the toughest man in the world is. One former contender for that title is the boys’ father Paddy (Nick Nolte), an ex-wrestling coach and recovering drunk willing to absorb a titanic amount of pain in order to return in any small way to his sons’ lives. The rest of the cast is filled out by grounded supporting players: Jennifer Morrison as Brendan’s sensible wife, Frank Grillo as his unorthodox trainer, the always welcome Kevin Dunn as his boss, who won’t rock the boat but will bend the rules to help his friend. That these players are tied to Edgerton’s character indicates the challenge Hardy faces, as a man who has absolutely no one in his corner. Hardy keeps his dialogue minimal, channeling Tommy’s torment into his body language and his eyes in a riveting performance. O’Connor boldly doesn’t have the brothers clap eyes on each other for an hour, and even then they don’t exchange words. Their first conversation is fraught with recrimination, mines planted decades earlier in danger of exploding. As for the physical battles, they are brutal, brilliantly choreographed and shot. O’Connor is attuned to the nuances of contact both in and out of the cage, and he finds innovative ways to incorporate fight film staples like the training montage and the press circus. 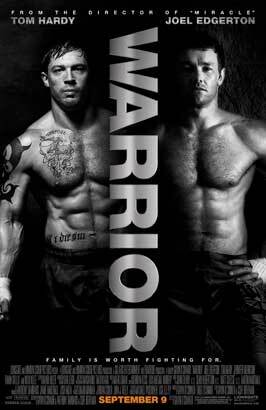 The final fight between Edgerton and Hardy is satisfyingly wrought, pulling no punches. O’Connor’s Miracle, about the 1980 U.S. Men’s Olympic hockey team, is one of the most satisfying sports films of recent years. His underappreciated Pride and Glory also addressed male bonding in an Irish Catholic family, but in the more expected milieu of a brood of New York cops. In Warrior he combines the two subjects with an unexpected backdrop. The result, equal parts Rocky and Eugene O’Neill, is an essential guy movie and one of the best films of the year. Mr. Vince is a renaissance man. He reads books (most without pictures! ), makes cool computer games and enjoys long walks on the beach…he enjoys them even more if he is holding a cocktail in hand. For his thoughts on books, films, music, sports and more, Check out his blog.